Solid wood kitchens à la TEAM 7. 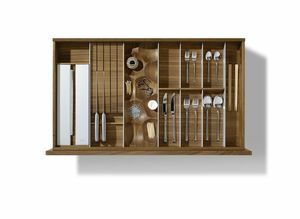 The insides of our kitchens are also made of 100% solid wood. This gives them the highest level of stability and resilience. Finished exclusively with natural oil, the wood is free from harmful substances and retains its anti-bacterial properties for hygienic food storage. Wood also has natural antistatic properties, which naturally reduces household dust. It helps to regulate humidity contributing to a healthy and pleasant environment. Yet it is incredibly undemanding. Our easy-care solid wood kitchens prove this with their suitability for everyday use. All that is needed for maintenance is simple, day-to-day cleaning up to minor repairs of dents and scratches. And if wood is treated regularly with natural oils, it retains its beauty for many years. Individually designed and custom-made exactly in accordance with your wishes, every TEAM 7 kitchen is genuinely unique, from the simple kitchenette to the luxurious eat-in kitchen with kitchen island, in a classic or modern style. 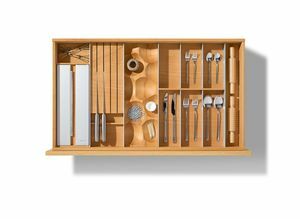 There are various programmes you can choose from when planning your dream kitchen, with solid wood or glass fronts and numerous handle types. Superior comfort is guaranteed by sophisticated storage solutions and technical innovations, such as the k7 kitchen island with its continuously variable height adjustment function. Our design elements create an especially cosy environment in your kitchen, and can be perfectly integrated into the kitchen and provide room for decorative accessories. Not a centimetre is wasted here. 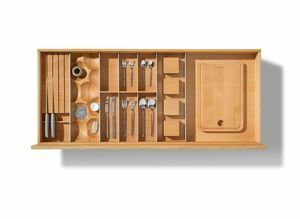 The custom-made fittings of our solid wood kitchens keep ingredients and cooking utensils close at hand, which enhances cooking pleasure. That's because order and a clear overview are as important as ergonomics. A very special treat is our premium system made of anthracite-coloured metal. 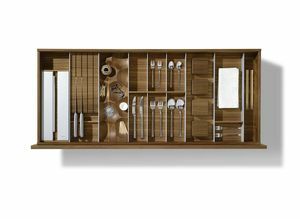 It has front and side rails made of solid wood, giving cabinet interiors a particularly exclusive appearance. A special touch for your kitchen. Our Waldkante wall cladding, made of completely untreated solid wood, adds the perfect spice to your kitchen design. With its fascinating surface structure, you can incorporate gorgeous accents into the design of your kitchen and create wonderful contrasts – for example, in combination with glass or stone surfaces.